Rotary vane pumps (fixed and simple adjustable displacement) have higher efficiencies than gear pumps, but are also used for mid pressures up to 180 bars in general. 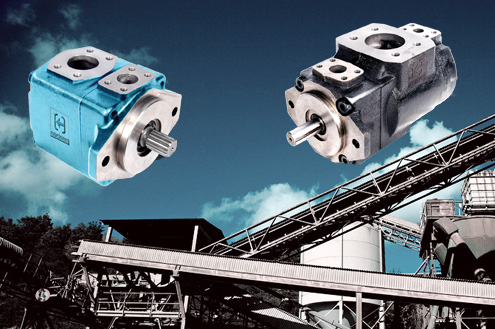 Modern units can exceed 300 bars in continuous operation, although vane pumps are not regarded as "high pressure" components. 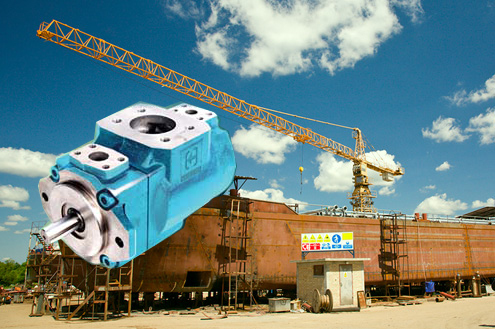 Some types of vane pumps can change the centre of the vane body, so that a simple adjustable pump is obtained. These adjustable vane pumps are in general constant pressure or constant power pumps: the displacement is increased until the required pressure or power is reached and subsequently the displacement or swept volume is decreased until an equilibrium is reached. A critical element in vane pump design is how the vanes are pushed into contact with the pump housing, and how the vane tips are machined at this very point. Several type of "lip" designs are used, and the main objective is to provide a tight seal between the inside of the housing and the vane, and at the same time to minimize wear and metal-to-metal contact. Forcing the vane out of the rotating center and towards the pump housing is accomplished using spring-loaded vanes, or more traditionally, vanes loaded hydrodynamically (via the pressurized system fluid). The simplest vane pump is a circular rotor rotating inside of a larger circular cavity. The centers of these two circles are offset, causing eccentricity. Vanes are allowed to slide into and out of the rotor and seal on all edges, creating vane chambers that do the pumping work. On the intake side of the pump, the vane chambers are increasing in volume. These increasing volume vane chambers are filled with fluid forced in by the inlet pressure. Inlet pressure is actually the pressure from the system being pumped, often just the atmosphere. On the discharge side of the pump, the vane chambers are decreasing in volume, forcing fluid out of the pump. The action of the vane drives out the same volume of fluid with each rotation. Multistage rotary vane vacuum pumps can attain pressures as low as 10−3 mbar (0.1 Pa). 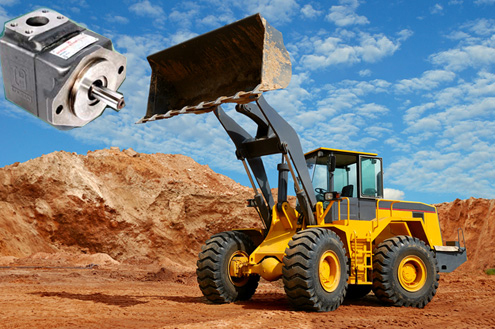 Common uses of vane pumps include high pressure hydraulic pumps and automotive uses including, supercharging, power steering and automatic transmission pumps. Pumps for mid-range pressures include applications such as carbonators for fountain soft drink dispensers and espresso coffee machines. They are also often used as vacuum pumps for providing braking assistance in large trucks and diesel powered passenger cars (whose engines do not generate intake vacuum) through a braking booster, and in most light aircraft to drive gyroscopic flight instruments, the attitude indicator andheading indicator. 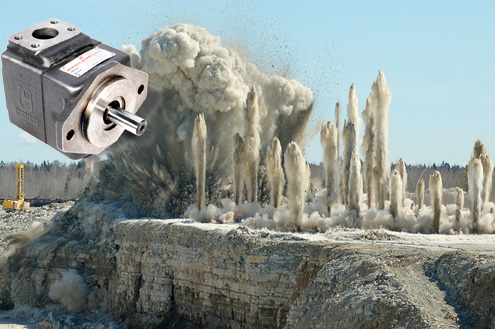 Furthermore, vane pumps can be used in low-pressure gas applications such as secondary air injection for auto exhaust emission control, and in vacuum applications including evacuating refrigerant lines in air conditioners, and laboratory freeze dryers, extensively in semiconductor low pressure chemical vapor deposition systems, and vacuum experiments in physics. In this application the pumped gas and the oil are mixed within the pump, but must be separated externally. 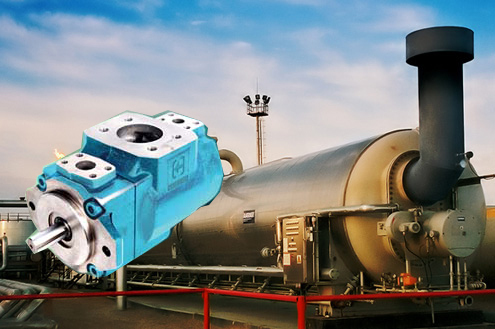 Therefore the inlet and the outlet have a large chamber–maybe with swirl–where the oil drops fall out of the gas. The inlet has a venetian blind cooled by the room air (the pump is usually 40 K hotter) to condense cracked pumping oil and water, and let it drop back into the inlet. It eventually exits through the outlet. One of the major advantages of the vane pump is that the design readily lends itself to become a variable displacement pump, rather than a fixed displacement pump such as a spur-gear (X-X) or agerotor (I-X) pump. The centerline distance from the rotor to the eccentric ring is used to determine the pump's displacement. By allowing the eccentric ring to pivot or translate relative to the rotor, the displacement can be varied. It is even possible for a vane pump to pump in reverse if the eccentric ring moves far enough. However, performance cannot be optimized to pump in both directions. This can make for a very interesting hydraulic control oil pump. Variable displacement vane pump is used as an energy savings device, and have been used in many applications, including automotive transmissions, for over 30 years.